The library is located in a renovated factory building in Sterlinga Street. It is 2799.3 square meters wide and has three levels. 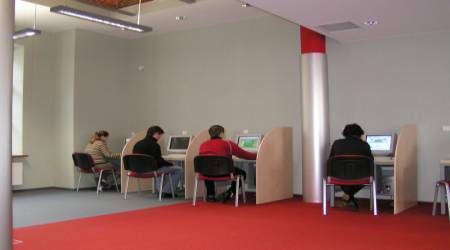 Readers’ assistance office, a locker room and a snack bar are located on the ground floor. The library offers free access to books on the first and second floor. It has 300 seats for readers as well as work desks with computers with access to the internet. The library’s collection consists of more than 5000 prints, 100 periodicals, maps, electronic, audio and audiovisual pieces. 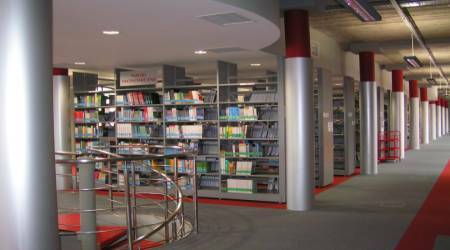 The library’s website provides access to electronic information resources, including: on-line catalogues, electronic database, online journals, books etc. The access to the library’s database is available for free to every student. An active lifestyle, thanks to regular exercising, has undoubtedly a positive effect on people. Not only it strengthens your organism but also raises the level of optimism. Scientific research proves that people who spend their free time actively are healthier, more enthusiastic, resistant to stress and deal with everyday problems better. The Center of Sports and Active Recreation offers a wide range of sport activities for AHE’s students: fitness, dance, gym, yoga, martial arts, self defense etc. We offer 4 professional gym rooms and an assistance of experienced coaches. Please note that AHE does not have its own dorm facilities. Students are required to look for accomodation on their own. In Lodz there is a variety of choices and websites where you can find the accomodation that bests suites your needs: from dorms and flats to hostels and private apartments. Please contact Erasmus+ coordinator in AHE if you encounter any problems finding accomodation.